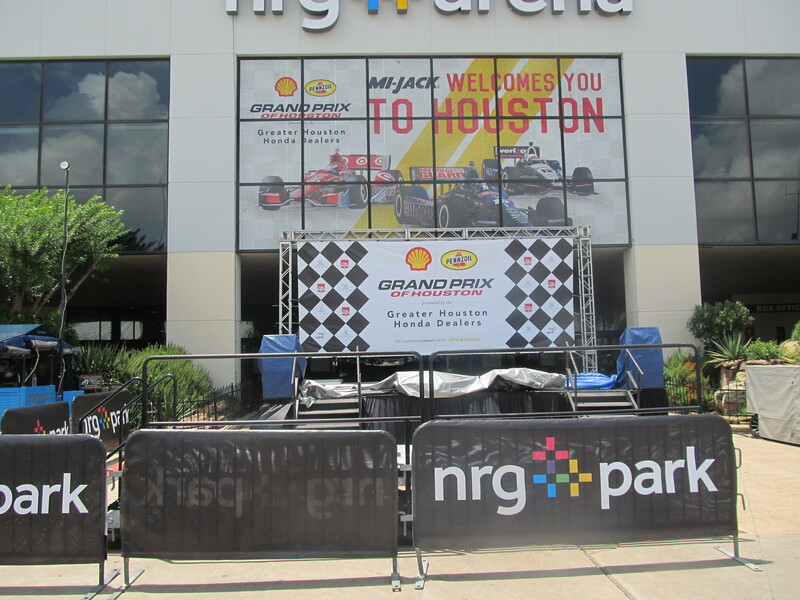 I was “lucky” enough to latch onto tickets to Friday practice at this week’s Verizon IndyCar race at NRG Park (formerly Reliant Park) in Houston. You’d think I’d be excited as blue blazes to go to an IndyCar race in the same city where I live. Yeah, it’s not quite that simple. As much as they try, the promoters of this event can’t shake one obvious fact: This is a race in a large parking lot. 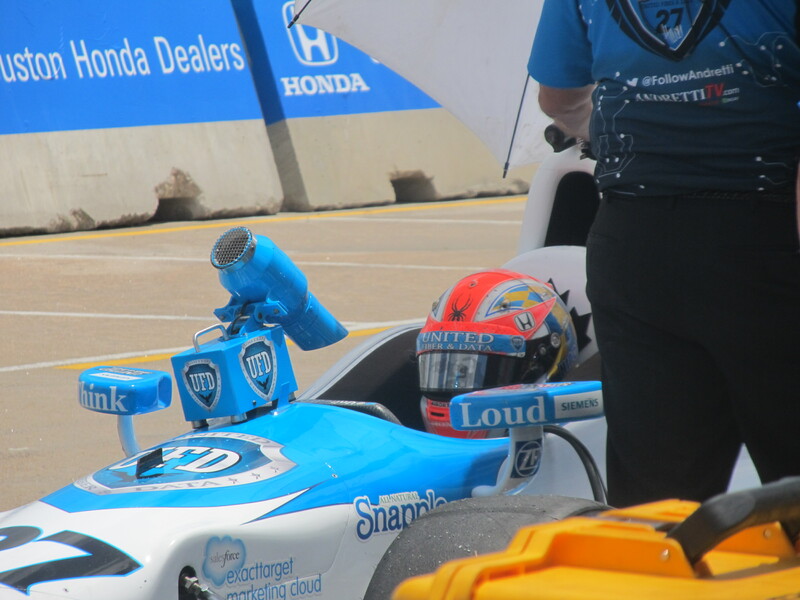 I snuck out of work for a few hours Friday afternoon and head to NRG park and sniff some race fuel. It’s across town, so I took advantage of a break in the spotty showers we’ve been having in the Houston area for a few days. The showers have kept the temperatures from creeping to uncomfortable levels, but only just. First off, NRG Park is a huge facility. It includes NRG Stadium (where the Houston Texans play), the old Astrodome, a convention center, an indoor arena (home to the Houston Livestock Show & Rodeo), some service buildings and acres upon acres of parking spaces. It is upon this expanse of overpriced NFL parking that they construct a 1.7 mile street circuit with a rather uninspired design. After being told the wrong lot to park in by the friendly security guard, I eventually parked in my $15 spot in a space not unlike the drivers of the Verizon IndyCar series would soon be driving on. The irony wasn’t lost on me. I entered by turn 6 and was directed into the NRG Stadium only to get my ticket scanned and exit the stadium into the circuit. There are several temporary bridges to convey attendees to the inside of the course, paddock, pits and hospitality areas. The fact that USF2000 and Cooper Indy Lights didn’t tag along with the Verizon IndyCar Series and Pro Mazda guys is evident. In the area where the MRTI paddock would be, there is the paddock for SCCA MX5 Cup and the Pro Mazda, as well as some other vendors and the like. You can get a ride in the Predator monster truck, too. It really feels like a carnival that had half the rides and games not show up from their last show. Sure, I was there on a Friday with spotty weather conditions, but I’d expect there to be a lot more available to hold fans’ interest, and there simply wasn’t. There was a group of food trucks and local eateries. I supported a local business with an overpriced, albeit delicious queso dog and some fries. The number of dining options seemed to be lacking for the expected crowd on Saturday. There was ample space for more vendors, and I sincerely hope vendors fill it. We discussed this on the podcast recently (Episode 237), and it is exactly as I envisioned. It’s going to be a hot, humid day in a parking lot with shade available to those that can afford it. It’s certainly not a family-friendly environment, let alone the manicured lushness of road courses like Barber. When I returned and showed my wife the photos, she agreed that we’re pretty spoiled by going to Barber ever year, because the picnic-like atmosphere of the entire facility is hard to find in other circuits, let alone a temporary circuit like Houston. about ten feet wide between the grandstand structure and the teams’ pit areas. Some teams had to store extra hardware in this walkway, creating a pedestrian choke point. It doesn’t matter, really, because at the entrance to the pit area, you can’t walk any further. You can only turn around and walk back up the pit lane area to the paddock through this narrow walkway. It’s a poor design, to say the least. I didn’t stick around very long, as I was technically working, and I had to respond to a customer issue as soon as I got back to my car, still motionless in my $15 parking space. I pulled out, but didn’t come anywhere close to 200mph like the guys in the other parking lot were. The circuit looks good on television, and it produced some good racing last year. That was the cooler temperatures of November, though. If the racing is still good, I might go back next year for the race, but it would be just me. Taking the toddler in that crowd with those conditions isn’t good for health or sanity. Never mind that the whole facility feels somewhat cold and uninviting. Sure, there’s an event going on. I’m even interested in that event, but the atmosphere doesn’t make the event seem appealing, at least not up and close. This one will be enjoyed from the comfort of my living room. I’m sure the beer will be cheaper, too. Pro Mazda – Can Pigot Get His Groove Back at Houston? Been to CART and other races in Houston. Ugh. “hot, humid day in a parking lot with shade available to those that can afford it. .. not a family-friendly environment, … lushness of road courses like Barber” and Mid-Ohio and Road America and Watkins Glen. I guess that this is made for television and for sponsors’ guests who spectate and hobnob in air-conditioned hospitality suites. I’m sure there will be a decent crowd for the weekend. If weather cooperates, I think 60-65,000 for the weekend is a good showing. I know Honda gave away loads of tickets. Honda dealers were giving away two tickets if you test drove a car and I’m sure there were other promotions as well. Friday saw groups of school-age kids from local church or YMCA day camps walking around, and that was cool. 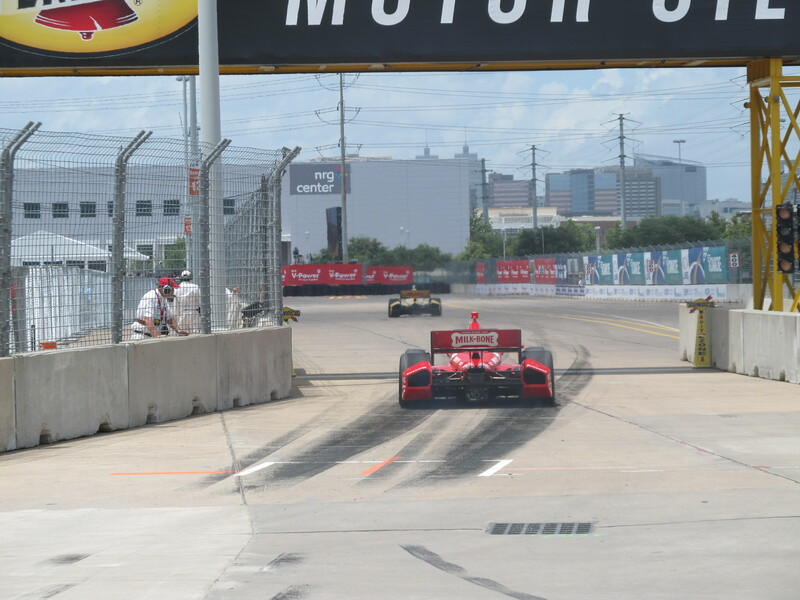 Last year, they had the entire MRTI, IndyCar and I think Pirelli World Challenge. The paddock areas were packed, at least from TV shots, perhaps overly so. This year, all those areas are barren, and it looks bad. It looks empty, to be honest. I was really glad we’d used our common sense and not purchased tickets. Whoever decided on a parking lot in Houston the last weekend in June has clearly never watched The Weather Channel nor purchased an almanac. And I have to add, John just mentioned to me there was no event pin. Because everyone will remember this race from the heat stroke, not the pin… I will get you a hot dog, fries, and a bottle of water for way less than $17.50, and I guarantee you it will taste better.